In the previous post, Working with Young Chickens, the chickens were just starting to get big enough to put outside. We were hardening them off so that they’d survive the elements. The chickens are most definitely large enough now to go outside (and have been for about two weeks). Each chicken has about 2 square feet of space in a chicken tractor. However, the chicken only lives in that space for a few days. During the time the chickens are living in the chicken tractors, they’ll actually use a 24-foot × 80-foot area (or about 25.6-feet per chicken). Of course, the question is, “What is a chicken tractor?” Our version of the chicken tractor is a square bottomless cage with a roof that allows the chickens to access bugs, grass, dirt, and other items that a chicken would normally want to access, but in a safe environment. Here’s one of our older chicken tractors. This particular chicken tractor is 4-feet wide and 8-feet long. It has handles at either end for moving it from place-to-place. 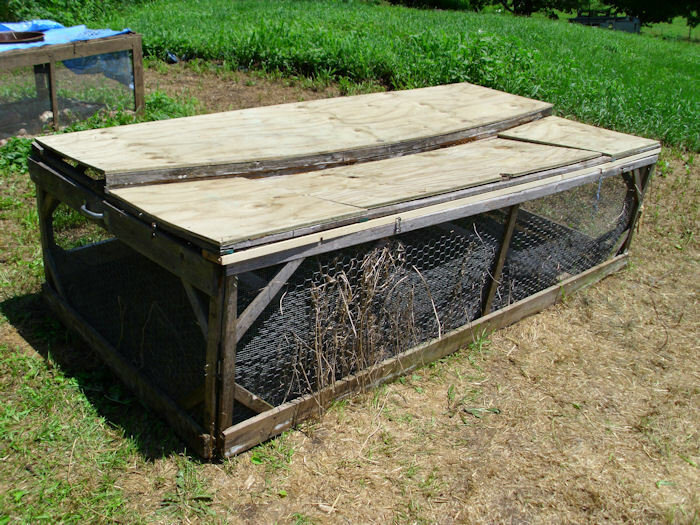 Chicken tractors come a wide variety of forms, but the idea in all cases is to provide a movable cage that lacks a bottom. When the birds are young, we move our chicken tractors once a week. As they get older, we move them progressively more often until we’re moving them every three days before we process the last of them. You shouldn’t use pressure treated lumber for your chicken tractor because the chickens peck at the wood. Anything the chickens eat, you also eat. That’s the same reason you don’t want to paint the lumber unless you want to invest in non-toxic paint. The only exception that you can reasonably make is to use ½-inch CDX plywood for the roofs because the chickens don’t get anywhere near them. Unfortunately, the use of non-treated wood means that we have to perform repairs on the chicken tractors each spring, but so far, the repairs have been minimal. It looks like each chicken tractor will last six to eight years (perhaps longer as I gain experience). At that point, you need to build an entirely new wooden frame because the old one will rot enough to require replacement, but the hardware cloth, handles, and hinges are still perfectly good, so you can recycle them. In fact, it’s possible that you can even reuse some of the staples used to hold the hardware cloth in place. The cost to build a chicken tractor is about $240.00 with the hardware cloth, so you need to factor $30.00 to $40.00 into your costs each year to account for wear and tear on them. As with any building enterprise, I made mistakes with the first few chicken tractors. For one thing, I tried using chicken wire the first time. The racoons demonstrated that they can easily overcome chicken wire and had a good chicken dinner as a result. Another thought I had was to build the chicken tractors with hinged joints so I could take them down each winter for storage. The solution proved problematic and the rotting was actually worse than if I had left the cages up all winter. I also made the door on the top of the cage too large the first time and the chickens demonstrated an unswerving ability to get out of the chicken tractor while I was trying to feed them—leading to Keystone Cop episodes of chicken catching. I’m sure I’ll continue to learn new tricks as I build new chicken tractors. We supply two roosts to divide the cage into thirds. 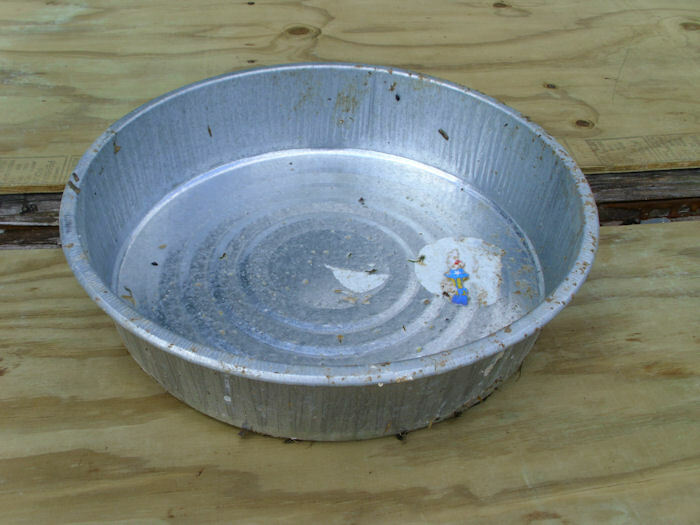 The left side contains their water dish and the right contains the food dish. 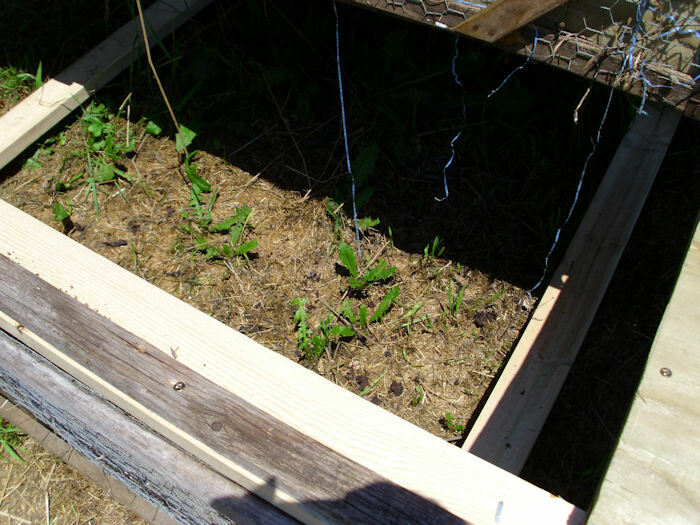 The center is completely free of any encumbrance so the chickens have a free space in which to roam. The roosts are 2-inches above the ground so that they aren’t too high to reach, yet provide complete protection from the ground, even when it rains. As you can see, it’s nothing fancy. A pan like this will last around five years. It holds 3 gallons of water, which is more than enough for the chickens in the chicken tractor. If you have any questions about these chicken tractors, let me know at John@JohnMuellerBooks.com.